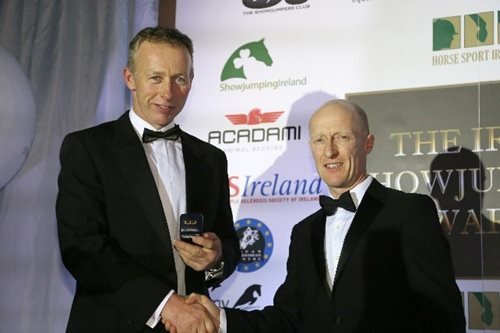 Saturday night at Kilashee House Hotel was a gathering of the who’s who of Irish Showjumping. The night kicked off with Sven Hadley being presented with his award for Connolly’s RED MILLS Spring Tour Overall League Champion 2017. Sven won 3 legs of the series with the ever-competitive ‘Suma’s Taloubet’. 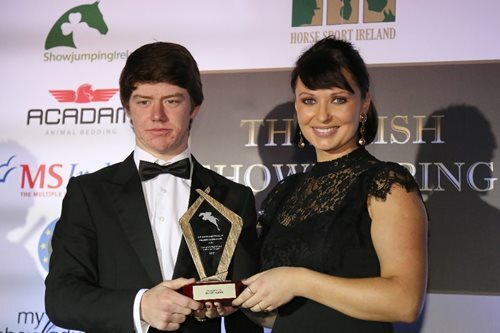 The Connolly’s RED MILLS Spring Tour Leading Young Rider Award was presented to Mikey Pender. Mikey is stable rider to RED MILLS Ambassador Marion Hughes. Mikey had a great series, winning in Cavan Equestrian and runner up at Portmore. 3 RED MILLS Riders received Gold Badges: Shane Breen, Dermott Lennon and Billy Twomey. RED MILLS Riders Bertram Allen and Darragh Kenny were awarded Silver Badges of Honour. Allen has been on cracking form recently. This weekend he won the Stockholm Grand Prix with Gin Chin van het Lindenhof taking home a new car, the 10thnew car of his career. 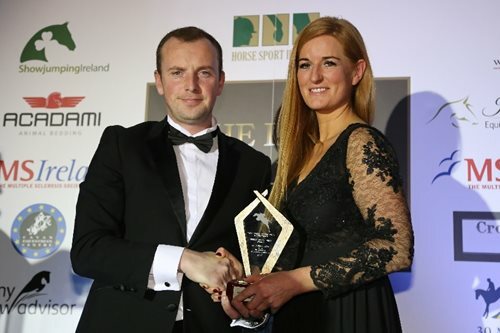 The Junior Team of the year was awarded to the Pony European Champions. The team consisted of Harry Allen, Abbie Sweetnam, Ciaran Nallon and Kate Derwin. 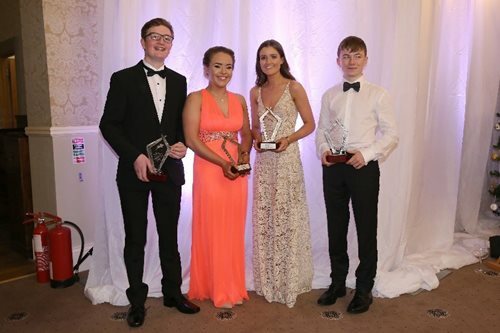 The Senior Team of the Year went to the Senior European Champions. A first European team medal for a Senior Irish Showjumping Team since 2001. 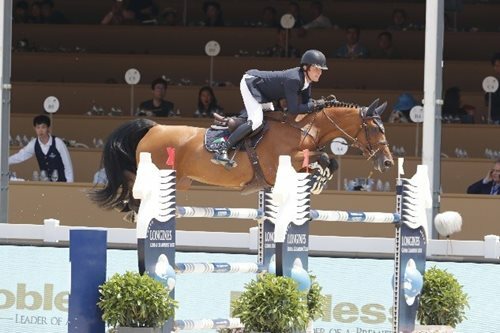 The Team consisted of Shane Sweetnam, Denis Lynch, Cian O’Connor and RED MILLS Ambassadors Bertram Allen and Chef d’Equipe Rodrigo Pessoa. 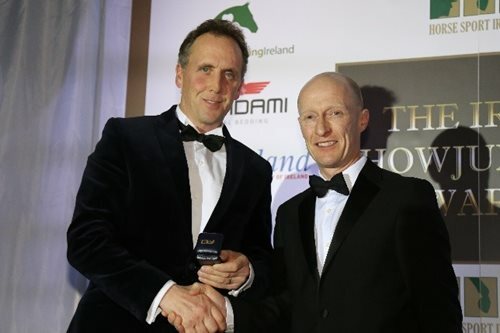 The Special Achievement Award went to RED MILLS Rider Ger O’Neill and the Irish Sport Horse Mare ‘Columbcille Gypsy’ the Six-Year-Old World Champion 2017. It was the second year in a row Ger had won the championship having won it the previous year with ‘Killossery Kaiden’. Columbcille Gypsy and Ger were also victorious in the 2017 Irish Breeders Classic final. 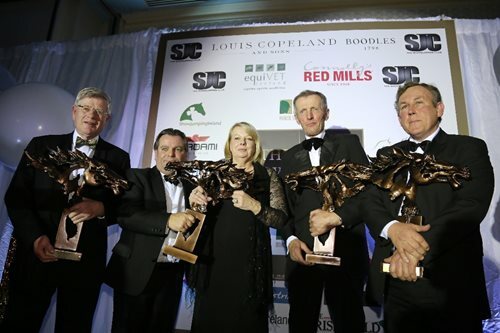 The highlight of the night without doubt was the induction of the quartet Paul Darragh, James Kernan, Eddie Macken and Captain Con Power into The Showjumpers Club Hall of Fame. 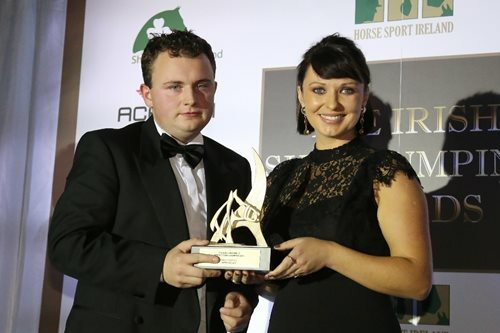 They are widely regarded as the most talented Irish Showjumping Team ever assembled. This quartet won back-to-back Aga Khan Trophies between 1977 and 1979. Not only did the riders become household names, but also their horses! Paul Darragh’s Heather Honey widely known for her fiery attitude and swishing tail! Con Power’s Rockbarton not only helped the team win the Aga Khan trophy but also won the RDS Puissance in 1979. 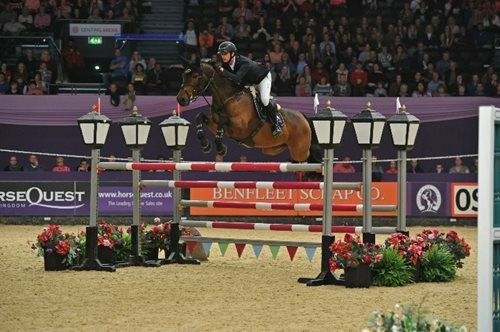 James Kernan’s Condy was victorious in the Hickstead and Ostend Grand Prix’s’. Lastly there was Eddie Macken’s Boomerang. Between 1975-1979 Eddie and Boomerang won or were second in 32 Grand Prix’s or Derby’s. They were also winners of four consecutive Hickstead Derby’s.